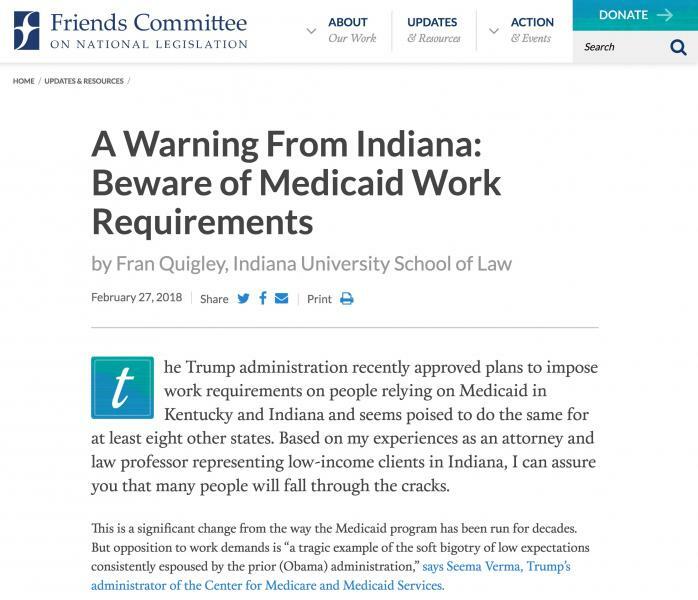 PFAM coordinator Fran Quigley published a blog post for the Friends Committee on National Legislation entitled, A Warning from Indiana: Beware Medicaid Work Requirements. Look for more PFAM activity opposing these planned new rules that are destined to cut off low-income and disabled persons from the medicines and treatment they rely on. The Trump administration recently approved plans to impose work requirements on people relying on Medicaid in Kentucky and Indiana and seems poised to do the same for at least eight other states. Based on my experiences as an attorney and law professor representing low-income clients in Indiana, I can assure you that many people will fall through the cracks. They will not be able to find and keep sufficient employment or jump through the bureaucratic hoops set up to qualify for exemptions. They will be kicked off the only health care program they could possibly obtain. They will suffer with pain and illness unrelieved by medicines or a physician’s care. Some will die as a result.